A summary of Saturday's action in Ligue 1, Serie A and La Liga. 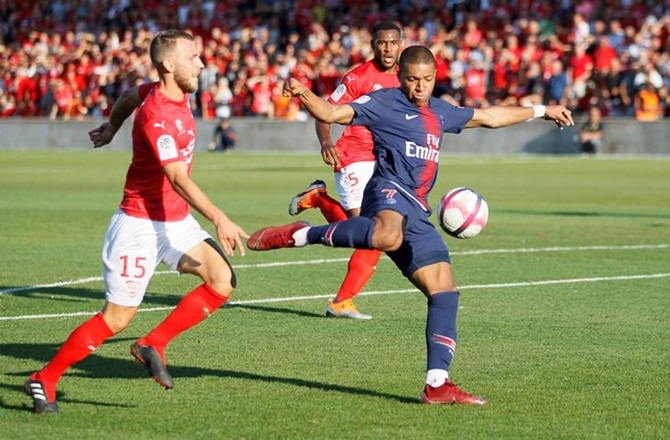 France forward Kylian Mbappe struck a second-half stunner before being sent off late on as champions Paris St Germain maintained their 100 percent Ligue 1 record with a 4-2 victory at promoted Nimes Olympique on Saturday. World Cup winner Mbappe scored with a powerful volley in the 77th minute to put PSG up 3-2 after Neymar and Angel di Maria's first-half strikes were cancelled out by Antonin Bobichon and Teji Savanier. But PSG's victory was soured as Mbappe was sent off in the third minute of extra time after clashing with Savanier, who was also dismissed, following a late tackle by the Nimes midfielder. Nimes were not done yet and clawed their way back in the second half with a well taken goal from distance by winger Bobichon and Savanier's penalty which was awarded after the intervention of the Video Assistant Referee (VAR). However, PSG were rewarded for their relentless attacking and their superior quality up front helped them ease to victory. Tuchel's side are top of the league table after four games and could be joined on 12 points by Dijon who face Caen later. 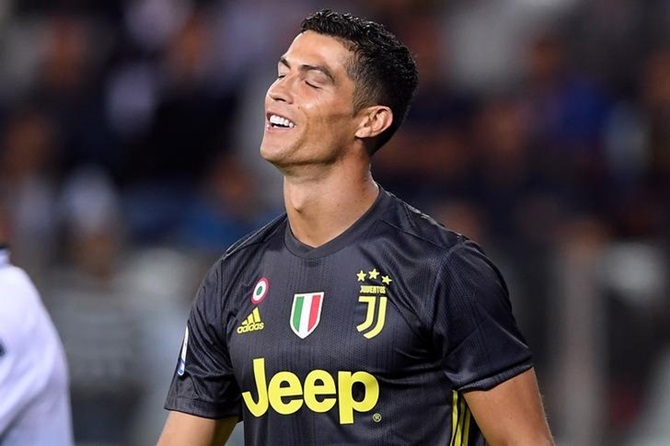 Cristiano Ronaldo was left waiting for his first Juventus goal after drawing another blank as the title-holders won 2-1 at Parma in Serie A on Saturday to maintain their 100 percent record. Ronaldo kept trying but it was a frustrating night for him as Parma cut off the supply lines and prevented him getting in any of his dipping long-range shots. Real Madrid continued their perfect start to the Liga season by thrashing neighbours Leganes 4-1 at the Bernabeu helped by a Karim Benzema double, while Atletico Madrid slumped to a 2-0 defeat away to Celta Vigo on Saturday. Benzema then struck his fourth goal in two league games from a delightful backheel by newly-crowned UEFA Player of the year Luka Modric, moving to within one strike of equalling his tally of five league goals over the whole of last season. 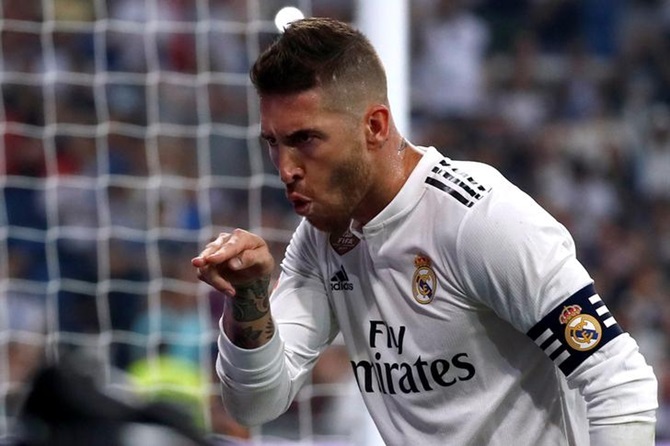 The Frenchman had the opportunity to complete a hat-trick when Madrid were awarded a penalty after lively winger Marco Asensio was tripped by Unai Bustinza, but captain Sergio Ramos took responsibility for the spot-kick and completed the rout by scoring for the second game in a row from the spot. Diego Simoene’s Atletico suffered their first major setback of the season with the reverse at Celta following a hapless second half display in which they conceded two goals in quick succession and had defender Stefan Savic sent off. Celta’s Uruguayan striker Maxi Gomez put the Galicians ahead after the break after a slip by compatriot Diego Godin and Iago Aspas doubled the lead in the 52nd with a header the day after being dropped from Spain’s squad by new coach Luis Enrique. Things got worse for Atletico after 70 minutes as Montenegro defender Savic was dismissed for a second booking and a minute later they thought they had conceded again but Gustavo Cabral’s effort was ruled offside by the video assistant referee (VAR). Atletico have four points from their opening three games and are already five adrift of local rivals Real in the title race.